Once upon a time, having meatless friends over for dinner inspired panic: The vegans are coming! The vegans are coming! Luckily, my most frequent veggie-loving guests are flexible and appreciative of even the simplest vegetarian presentations, and I'm getting better at rising to the occasion. Desserts still challenge me: Fruit is an elegant, straightforward finish to a meal, but the kids are inevitably disappointed. I know many of the tricks for making baked goods dairy-free, but as the daughter of an excellent baker I find myself missing the real thing. 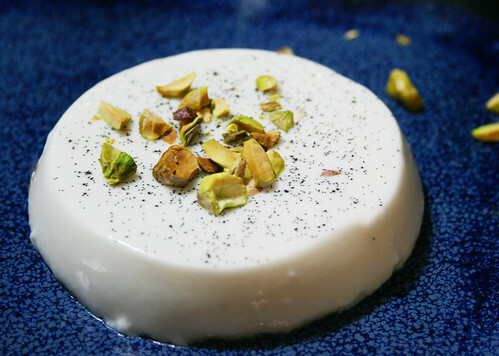 This rich, dairy-free panna cotta, made with coconut milk and coconut cream, just might top any of the dairy versions I've had. Cardamom, allspice, vanilla, and cloves infuse it with just the right spicy kick. Best of all, you can make it well before your guests arrive. I used coconut cream I found at Trader Joe's along with full-fat coconut milk. You can make a lighter version with a blend of regular and low-fat coconut milk, but you need some fat to keep it creamy. I love the vanilla bean speckles, but if you want a pure white panna cotta either substitute vanilla extract or keep the bean intact. I used one 14-ounce can of coconut milk and 10 ounces of coconut cream. You can use up to 2 cups of low-fat milk with a cup of full-fat milk. This makes 6 to 8 servings. Don't feel tied down by the specific spice ingredients here — adapt types and amounts to suit your taste and what you have on hand. Sprinkle gelatin over water and let sit for 5 minutes. Warm cream over low heat and add gelatin, stirring to dissolve completely. Add sugar and cook, stirring, over medium heat, until mixture just begins to steam. Turn off the heat, add vanilla bean and spices, cover, and let sit for 20 to 30 minutes. Lightly oil 6 to 8 ramekins. Pour mixture through a fine mesh strainer into prepared ramekins and chill at least three hours or until set. To serve, run a knife around the inside edge of each ramekin. Turn upside-down over a plate to unmold. Serve garnished with toasted coconut, chopped pistachios, toasted sliced almonds, or a drizzle of pomegranate molasses.